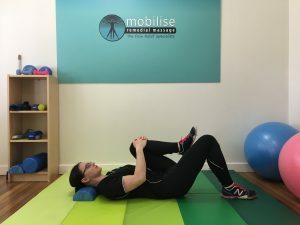 Welcome to Mobilise Remedial Massage! 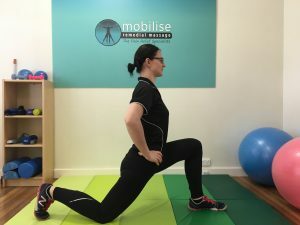 At Mobilise, we see people every day suffering from lower back issues. 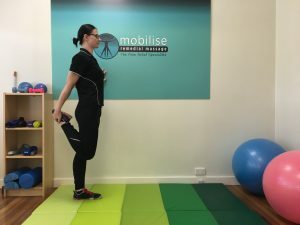 While we always recommend having an appointment with one of our Myotherapists or Remedial Massage Therapists to get a thorough assessment, treatment and rehab plan, here are a few really simple stretches and exercises to help reduce back pain when it occurs. None of these should cause pain or tingling/pins and needles – if they do, stop the program and talk to a Myotherapist as soon as possible. Lie on a mat as shown, with your knees bent to 90 degs and your feet flat on the mat. Rock your knees slowly sideways to the mat, and then slowly back to neutral. Then rock them slowly to the other side and back. Try to keep your feet flat on the mat as you do. Repeat this movement 20 times, morning and night. This reactivates core muscles and gently mobilises the lumbar spine. Lie on a mat as shown, with your knees bent to 90 degs and your feet flat on the mat. Pull one knee towards the same shoulder, in towards your chest, and lower. Pull the other knee towards the same side shoulder and then lower. Repeat 20 times. This stretches the lower back muscles and mobilises the SIJ, lumbar and pelvic joints. Lie on a mat as above, with your knees bent to 90 degs and your feet flat on the mat. Imagine you’re in the middle of doing a wee (we know, we know, but it’s an easy way to explain this…). Now “stop the wee” with your lower tummy muscles. Now, do it again – but at only about 10% of your strength. You should be contracting the deepest of your abdominal core muscles – the Transverse Abdominis “TA’s”. When you have a lower back problem, these muscles will very often become weak or dysfunctional. 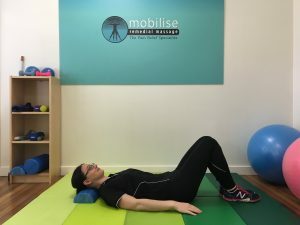 As they are the base of your core strength, retraining the TA’s becomes the first priority for good core biomechanics (which will allow the lower back muscles to relax and reduce the pain and spasm that you feel). Try and do about 30 small contractions of 2 secs each per day. Lie on the mat, with one leg flat and the other with your knee bent and pulled up towards your opposite shoulder, until you feel a stretch through your bottom. It should feel uncomfortable, but not painful. Hold the stretch for 20 seconds, relax for 2 seconds, and then hold the stretch again for another 20 seconds. Do both sides. Kneel down, in a lunge position as shown. Keeping your back straight, drop your body down gently into the lunge and stretch the front part of the hip of the back leg. Hold the stretch for 20 seconds, rest for 2 seconds, then repeat the stretch again for another 20 seconds. Do both sides. Standing upright, and stabilising yourself with your other hand, pull one foot up behind you, bending the knee. Hold the stretch for 20 seconds, rest for 2 seconds, then repeat for another 20 seconds. Do both sides. 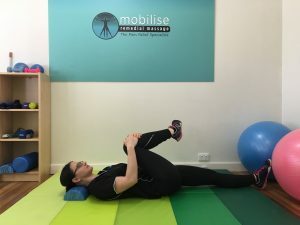 Repeat this set of exercises daily or twice daily, and if the pain continues, come and see one of our highly trained therapists for a comprehensive treatment and rehab plan today! Read more about the types of treatment for lower back pain, or about disc bulge specifically in our website blog. Or if you’d like to book an appointment with one of our expert massage therapists, you can book online from HERE.